Jim Oaks, one of the very best jibers in the Gorge, will be giving a jibing clinic this coming Saturday, Sept 2. No matter how good or how bad your jibes are you can learn a lot from Jim. The free clinic will be at the Northwave building just east of the new Water Front Park. Thanks Mike for getting the word out. There will also be a rigging clinic I hear. 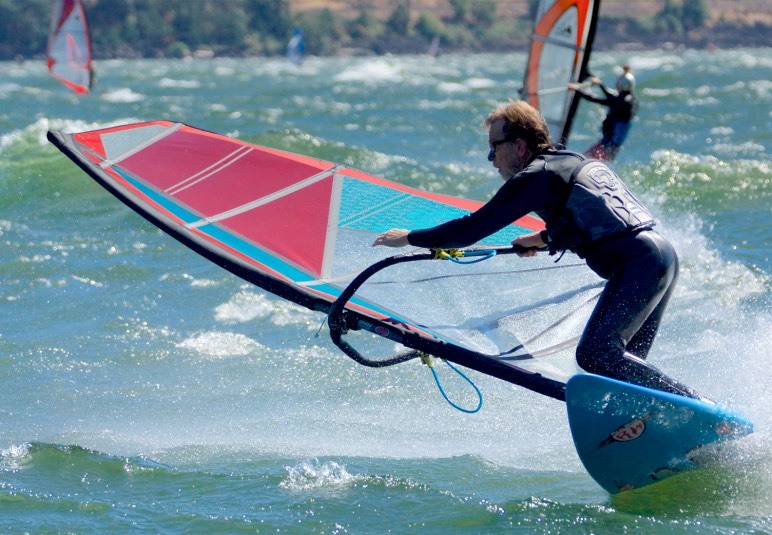 It is so great to hear that Northwave Custom Sails is still making all of their sails right here in the Gorge. Made in the USA....gotta love it!!!! I was surprised so many sailors showed up for the clinic. It was fun and rewarding for me. Several people said the tips shared really helped them. At the rigging clinic a friend of mine was looking at my sail and said" I just ordered a quiver of those, how do you get the headcap so low". I told him it's a new fixed head design. He walked right into the loft and talked to the sailmaker just in time to change his sails to the fixed head. I thought it was so cool to be able to talk face to face with your sailmaker and have him happily make a last minute change. It looks like we will we be doing the clinics again, probably next spring. Thanks to all who came this year.